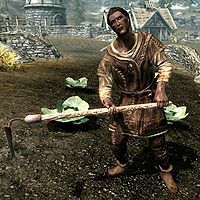 Severio Pelagia is an Imperial farmer who owns Pelagia Farm just outside Whiterun. He will pay you for any cabbages and potatoes you bring him. While his apprentice Nimriel lives at the farm, Severio owns a house in the center of Whiterun and sleeps there every night between 11pm and 8am. After waking up he heads down to the farm and helps Nimriel tending the crops for twelve hours. At 8pm he was supposed to spend three hours at the Drunken Huntsman, but doesn't due to a bug. Instead he keeps tending the farm until 11pm when he finally heads home to bed. He wears a belted tunic with a pair of boots. He carries an iron dagger and the key to his house. When you meet him, he will always complain about the weather: "There's a nip in the air. Cold won't be good for my crops. Never is." He will then proceed to tell you about himself: "I own the Pelagia Farm, just outside the city walls. Nimriel takes good care of things for me. ", "I had my years of war and fighting. Senseless, all of it. All I want now is a rake and a patch of good soil. ", "You should buy some produce from Carlotta's stall. Most of it comes from my farm." and "You should stop by my farm if you get a chance. See what life's really about." During the Battle for Whiterun, Severio will be killed and his house destroyed. Severio was supposed to spend his evenings at the Drunken Huntsman, but when he is halfway there, he decides to go back and work the land again. Severio may become permanently stuck standing next to the city gate in Whiterun. ? This page was last modified on 9 April 2018, at 00:43.